February 3rd: His name was Joseph, actually. Beautiful, elegant and quite simple – none of the terms that could be attributed to Joseph Merrick himself but all of them apply to David Lynch’s moving portrayal of his later years. The black and white photography, the Victoriana production design, the cast of recognisable English TV faces all combine with a sharp sympathetic script and some stunning performances to produce an excellent film. Luckily TCM are showing the widescreen version of the film and it looks stunning, the photography especially is clear and crisp. It seems as if the excesses of Lynch are curtailed to two sequences that contain much more power because of their brevity. The Elephant Man is a beautiful nightmare vision, you’d have to be the owner of a cold heart to not be moved by this piece of cinema. Interesting to note that Mel Brooks was the man who was determined to get the story of Joseph Merrick (John in the film) to the screen and he also fought to get Lynch as the director. Bonus points for spotting Pauline Quirke credited as ‘Second Whore’. 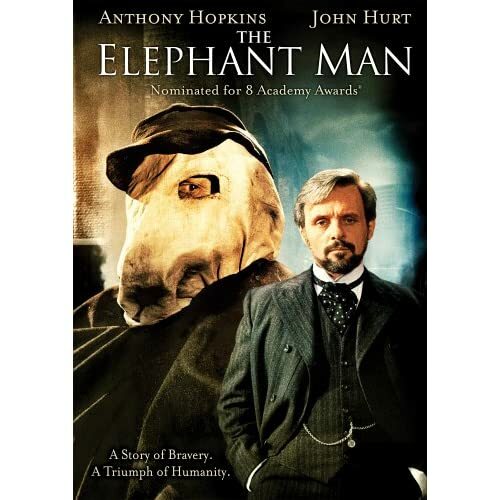 Note: The Elephant Man is listed twice in the Neon book 1000 Essential Movies on Video under ‘London Movies’ & ‘Depressing Movies’. Author ChrisPosted on February 8, 2009 Categories Chris vs Cinema, UncategorizedTags David Lynch, The Elephant ManLeave a comment on February 3rd: His name was Joseph, actually.